There seems to be a few really good and genuinely progressive rock bands fronted by female singers coming out of the North American sub-continent at the moment. You’re probably all aware of Bent Knee, and maybe Half Past Four, and Moe Tar, but you may not have heard of iNFiNiEN, which is a little devil to type so I will endeavour not to have to repeat the task too many times! The connection to one of those bands goes a bit deeper, as Moe Tar’s Tarik Ragab is responsible for the colourful cover art of the album displaying its wares before me. 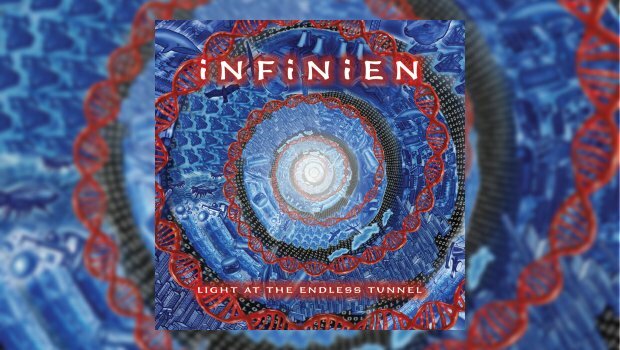 iNFiNiEN hail from Philadelphia, and Light At The Endless Tunnel is their second full-length album. They seem to have been around since about 2006, and in November of that year introduced themselves with an EP, followed a couple of years later with their debut self-titled album. Light At The Endless Tunnel is my first experience of the band, and what a heady and invigorating first date it is! The album came out in November last year, but I only stumbled across it a few weeks ago, and I am glad it didn’t fly under the radar, as it would have been a criminal omission. Thankfully, as the CD had a release date of 1st February 2017, it can squeeze onto 2017 lists, as it deserves to! The vastly wide ranging music that comprises this fabulous album is written by the whole band, either collectively or individually, resulting in a thrilling mix of ideas and creativity. I must admit, I am more than a bit smitten with its adventurously wide palette of sounds, a wide vista that takes in pop, rock, jazz, funk, Eastern scales, math-complex wigouts, Hollywood strings, you name it, it’s all here. All the players are masters of their instruments, and some marvellously complex guitar work, both chordal and solo on his own AYA mark out Matt Hollenberg as a fine wielder of the plank to be spanked. Chrissie Loftus also contributes keyboards – more Courtney comparisons – in an exemplary fashion, and throughout the intricate rhythms are handled with dexterity and aplomb by Jordan Berger and Tom Cullen. The fulsome and bewitching arrangements go way beyond my limited theoretical musical knowledge to explain here, and this all comes to an apogee on the fabulously involved and involving Off The Tracks, the sort of tune you could listen to on repeat twenty times and not get tired of, each play revealing something new as its headlong rush of a rhythm sees it charging off down the tracks. The luscious loungey feel of Bottom Of The Food Chain is the best way to get our breath back after that, and it highlights the sheer breadth of musical knowledge of this fine band, but even here it does not take long for the band’s irrepressible energy to rise up once more. Following that is the title track, a space-operatic avant math-prog symphony that at one point sounds like a ska band playing mariachi, beamed in from an alternate universe. Utterly mad, but it works. This group are a thoroughly modern definition of art-rock. The album reaches a high on the pairing of If I Were A Song/If You Were A Song, the latter taking me away into Steely Dan territory, with lashings of superlative guitar work from Mr Hollenberg. Stunning! Sorry, I know I’m gushing, and as you know that’s something this old scrote is not prone to do, so that should tell you all you need to know! I think I’ve found a band that equal Bent Knee in their enthusiasm and scope, and I can’t wait for more!